I am not sure how Punxatawney, Pennsylvania came to be crowned as the epicenter of Groundhog Day, or why they named their “official” sleeping rodent Phil instead of Pete (because let’s face it, “Pete” is true alliteration with Punxatawney, whereas “Phil” merely starts with a P but makes a completely different sound… but I digress, already…) BUT the fact remains that this year, Punxatawney Phil predicted an early Spring. And as much as I am reluctant to trust a large sleepy rodent with meteorological data, it seems he has just as much chance of being right as our actual weatherman. 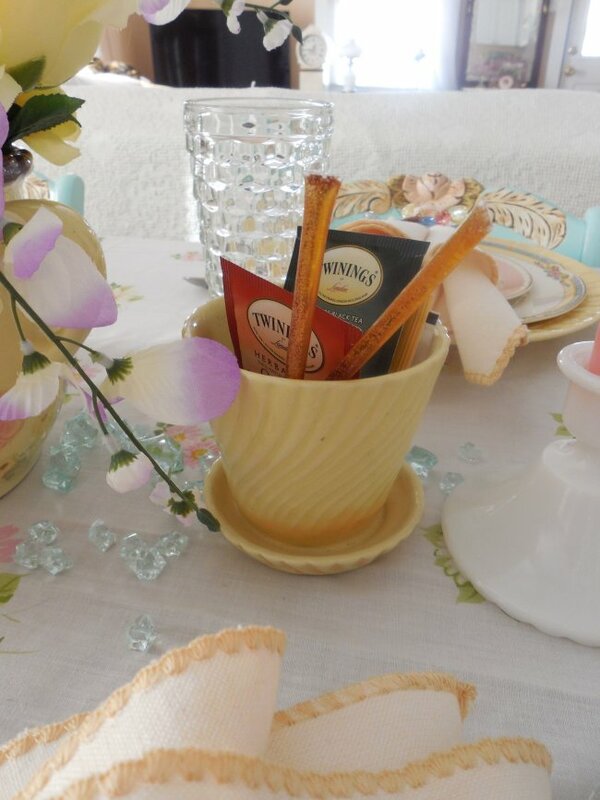 SO – “early Spring” it is, and for me that means right now. Yep, Winter is over, and it’s Spring. 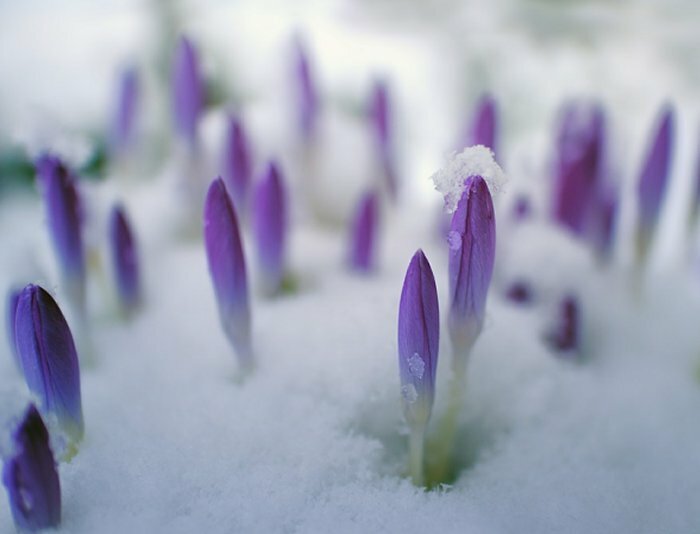 This early part of Spring is always cold and snowy, so we will ignore that and trust that underneath the snow, daffodils and crocuses are just about ready to pop out of the ground! Image of early Spring crocuses courtesy of Pixabay. 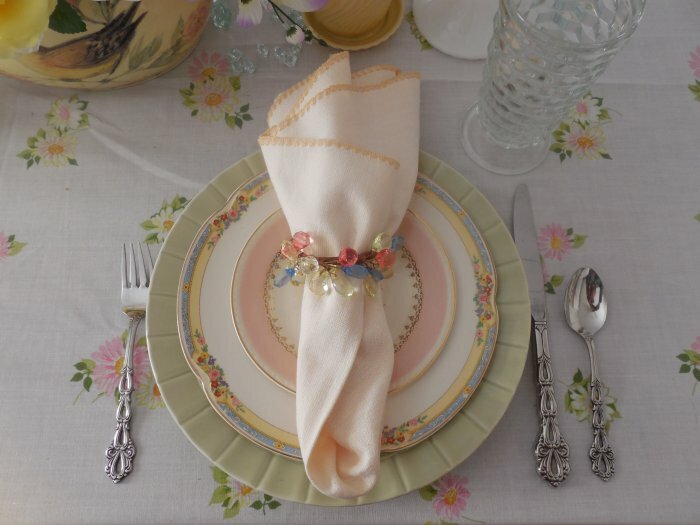 A change in seasons is always a good reason to set a pretty table (in case we need a reason besides dishes!) 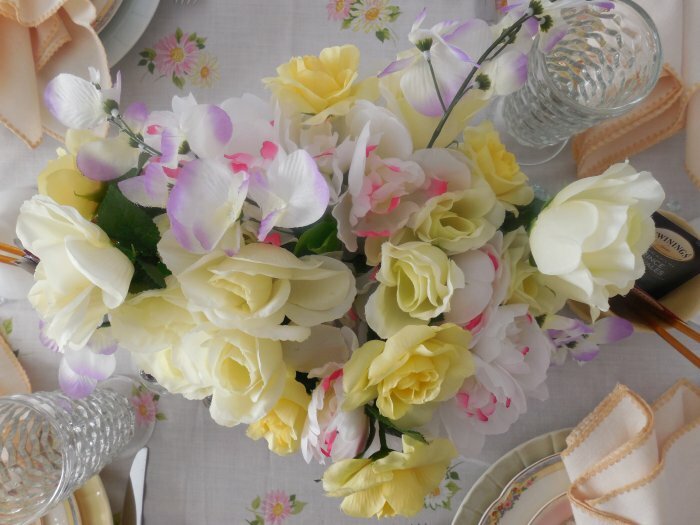 so today I’m sharing an early Spring table in the softest pastels and florals. 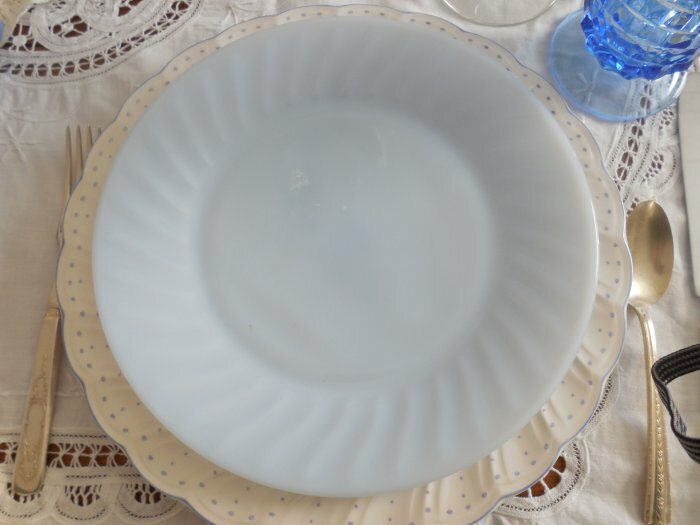 Right now the dinner plates I am using for my daily meals are a pattern by Martha Stewart Everyday (MSE) which features kind of a sculpted “box pleat” ruffle and a band of basketweave around the edge. I have them in yellow, green, and blue. 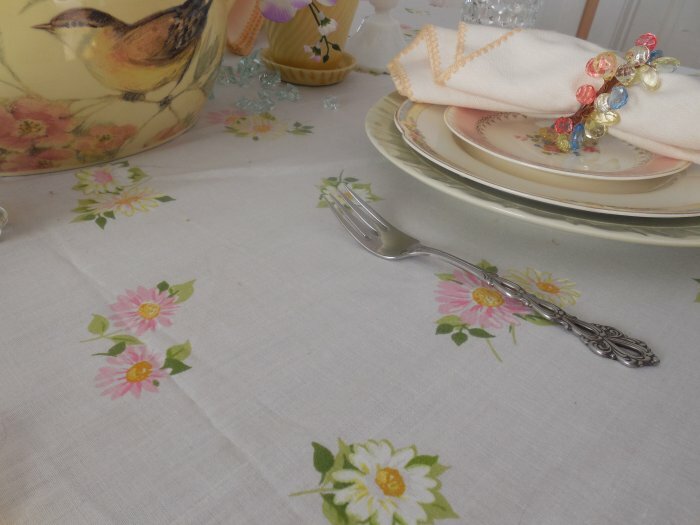 The tablecloth I used is actually a full-size flat sheet – it has the prettiest detailed edge, and the main surface area has a simple all-over floral design. 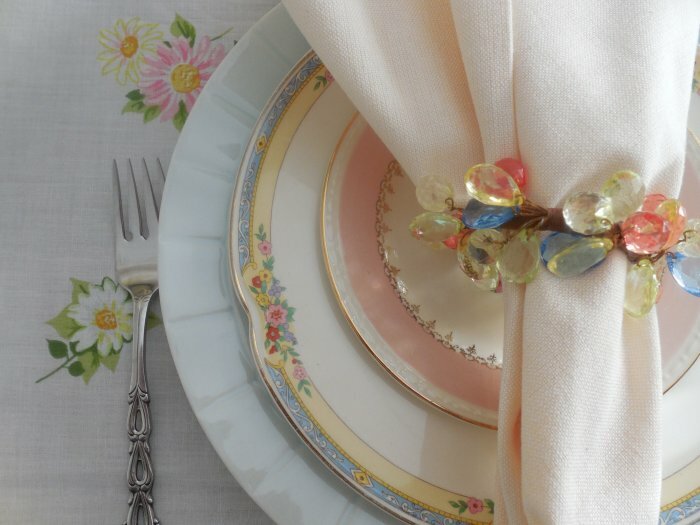 Napkins are palest yellow from Pier 1, and the napkin rings are beaded in the soft pastel versions of primary colors – perfect with this table, and on clearance at Bed, Bath & Beyond a couple of years ago. 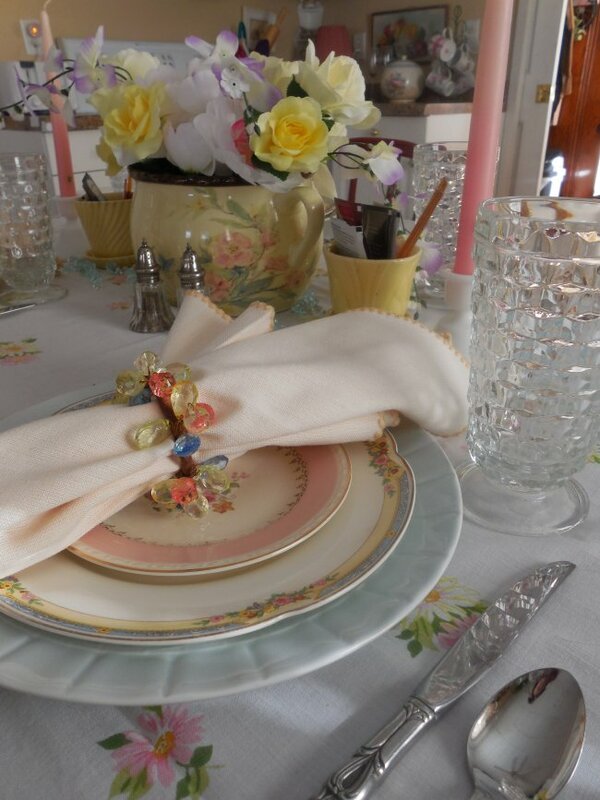 Flatware is my everyday Oneida “Chandelier,” and glassware is my often-used Whitehall in crystal by Indiana Glass. 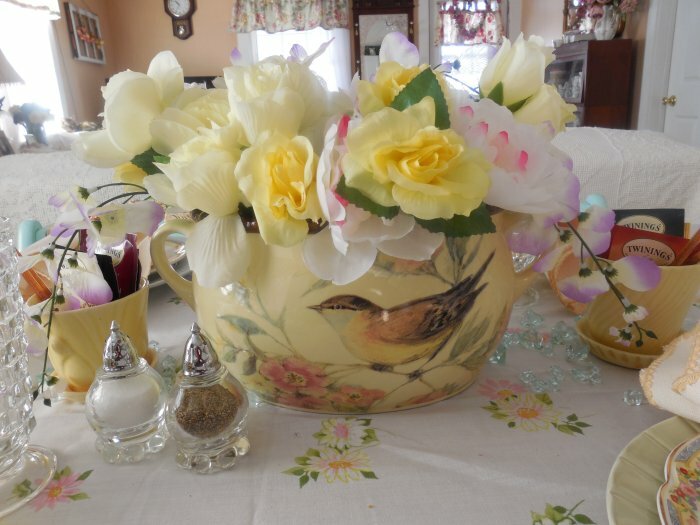 I especially loved this combination using the yellow MSE plate, so I decided to use my new-to-me (aka “secondhand”) Susan Winget “Somerset Song” bean pot as the centerpiece. 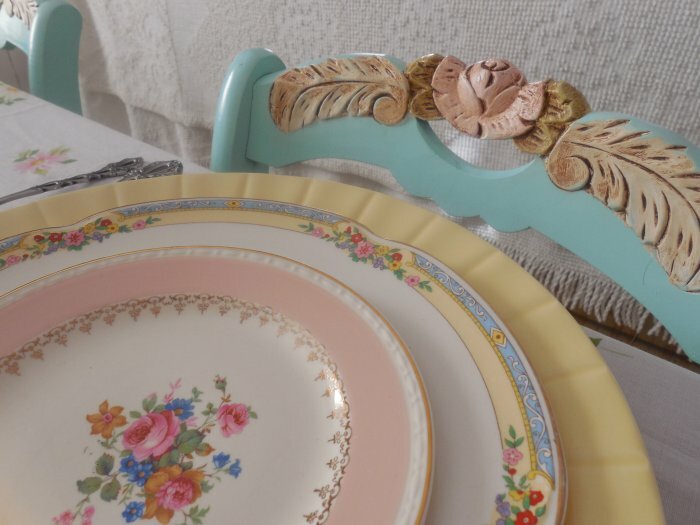 This piece was a wonderful bargain I found in the occasional shop run by my friend Traci of The Shabby Nest. 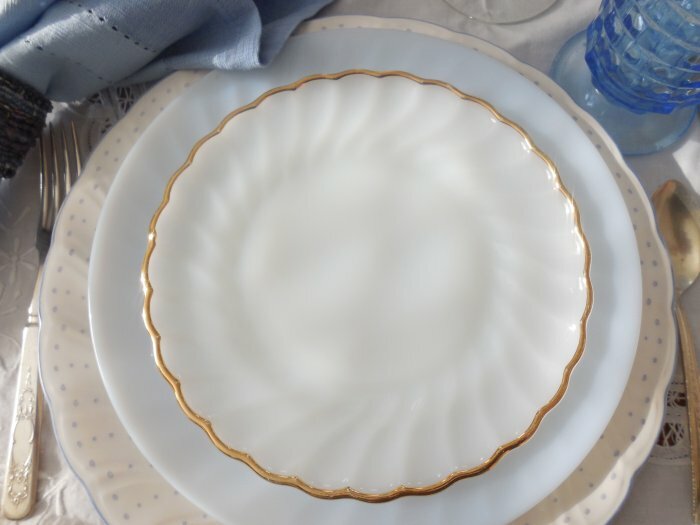 It’s not just decorative, it is dishwasher-, microwave-, and oven-safe – so it is a cooking vessel as well as being a beautiful lidded ceramic piece. 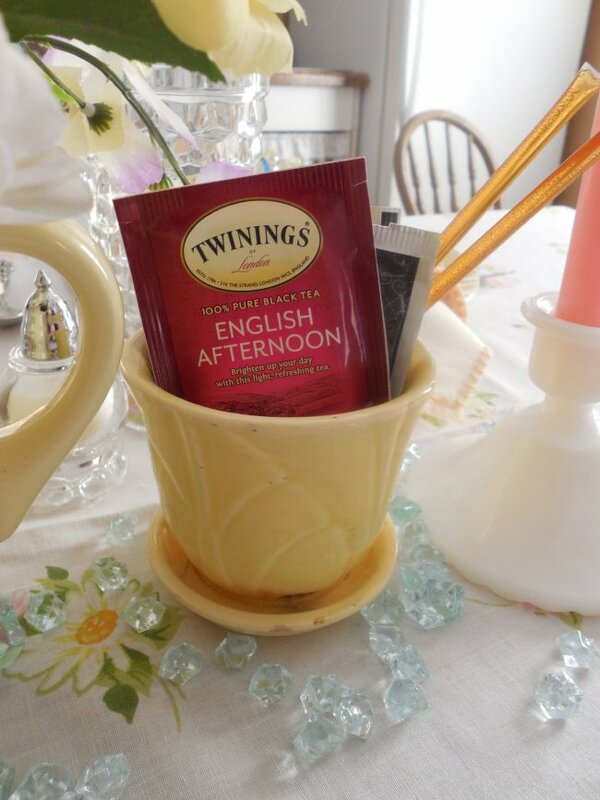 I filled it with soft yellow roses and other pastel florals from Dollar Tree. 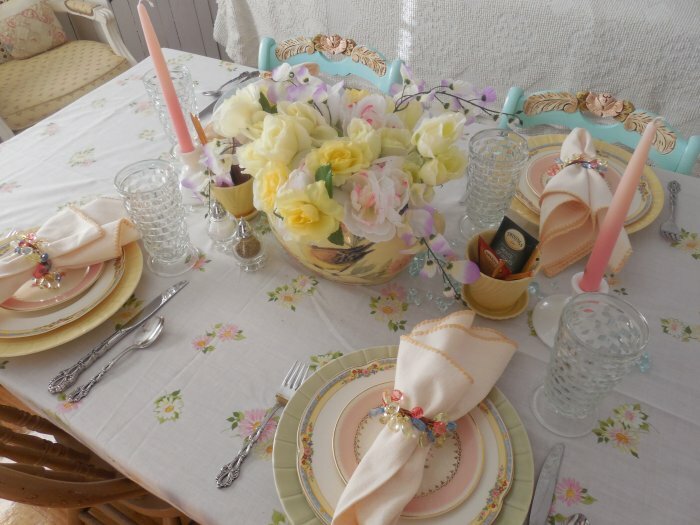 Also part of the centerpiece are these sweet McCoy pottery planters, each stuffed with honey sticks and a selection of tea for enjoying a bit later, a pair of milk glass candle holders, and pale pink tapers by PartyLite. 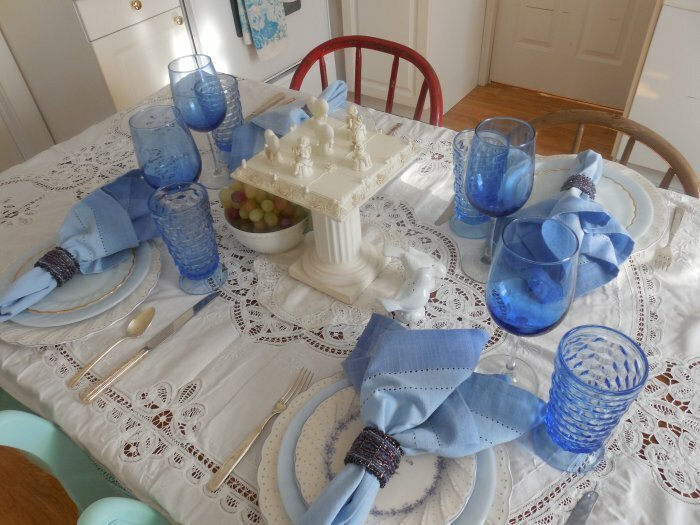 And, because we are admitting that it is still a bit snowy and wintery outside, I’ve also tossed down some ice-blue table scatter (used in my Ice Princess Table a year ago), just to carry through the pastel blue. Here’s a birds-eye view just for fun! I daresay any tablescaper will tell you that it’s worth the risk of falling off the step-stool to get this shot! 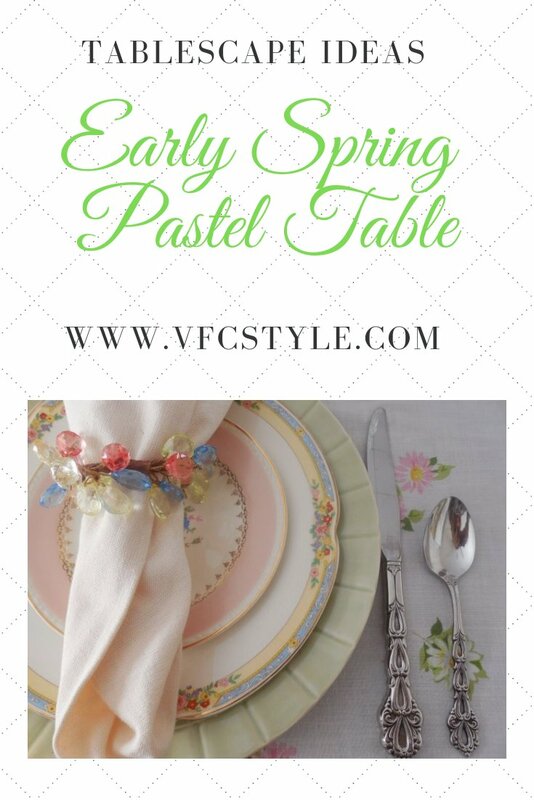 I’m sharing my early Spring pastel table over at Tablescape Thursday on Susan’s blog, Between Naps on the Porch! 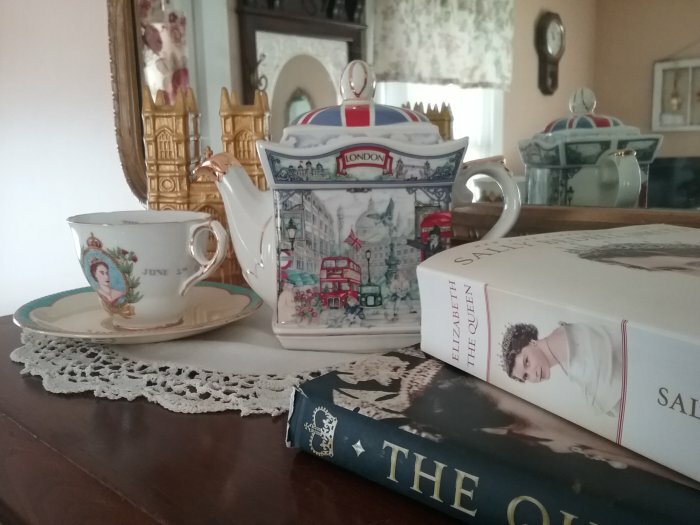 A small vignette atop my barrister bookcase, dedicated to Queen Elizabeth II of England. I am fascinated by Queen Elizabeth II – in fact, I consider her to be the most remarkable woman in the world. Here is a person whose destiny was sealed when she was just 10 years old. At that time, her uncle was King Edward VIII of England. King Edward was expected to marry a nice British girl, settle down, and raise a royal family full of heirs to the throne. Elizabeth was third in the line of succession to the throne, behind her own father, who would serve only if Edward and his future children did not. She was not expected to become Queen. Queen Elizabeth II visiting Australia in 1954, two years after becoming Queen (age 28). Photo courtesy State Library of Queensland. 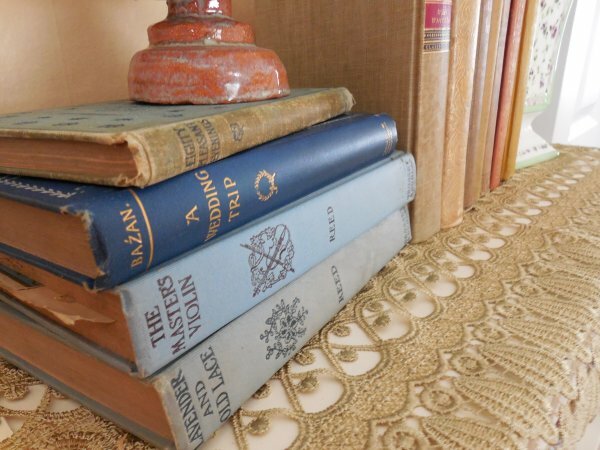 And then a rather unprecedented – and scandalous – thing happened: Her uncle gave up the title and position of King so he could marry an American divorcee – a marriage not allowed for the figurative head (and chief example-setter) of the Church of England. With his abdication, the title of King went to his brother – young Elizabeth’s father – who became King George VI. And because her father became the King, little Elizabeth was suddenly next in line to succeed him. And I think this is what fascinates me: at the age of 21, she seemed to understand the full gravity of what her future was to be, and she was already taking it very seriously, preparing for it, and acknowledging that serving as the Queen was to be her entire life. In 1951, her father the King began experiencing declining health. In February of 1952, Elizabeth and her husband Philip traveled to the realms of Australia, New Zealand, and Kenya. On February 6, following an excursion in Kenya, Elizabeth was informed that her father had passed away. She became the Queen at the moment of his death, and returned immediately to England. She was 26 years old. This year, February 6 marks the 67th year of Elizabeth’s reign. She is the longest serving monarch in British history, having surpassed the record set by her great-great-grandmother, Queen Victoria. She is also the longest serving current head of state in the world. Elizabeth’s life has indeed been long – she is presently 93 years old and continues to work daily to fulfill the promise she made to her people so long ago. She has endured decades of change, tumult, peace, prosperity, hardship, war, and much more, both personally and as Queen. And always – always – on the world stage, under the glaring spotlight of a sometimes hostile press. This is why I admire her so much. She pledged at age 21 to devote her entire existence to the service of her people, and she followed through. Her loyalty to her people, to her family, and to the institution of the monarchy itself has simply been unflappable for 67 years. She is human, and therefore imperfect, but she has been a constant figure on the world stage for her entire adult life, and still going. She has lived entirely in the public eye, with the singular goal of preserving the British monarchy by uniting the many nations under its leadership. I’ve read that Elizabeth herself does not choose to ‘celebrate’ her February 6 accession to the throne, because she feels that to do so would diminish the fact that it is the day of her father’s death. 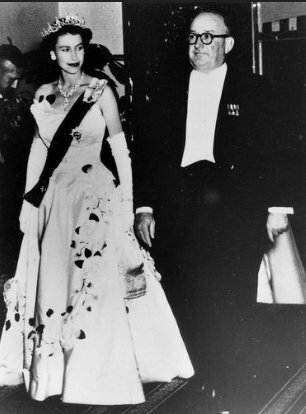 Instead she celebrates her coronation, which took place in June, 1953. 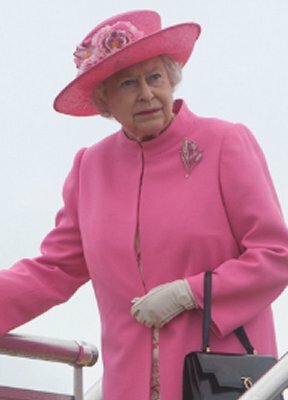 I do think it is worth noting that as of February 6, 2019, Elizabeth will have been the Queen of England for 67 years. A destiny she embraced, and continues to embrace, with dignity, grace, humor, earnestness, and sacrifice. She is a world treasure. 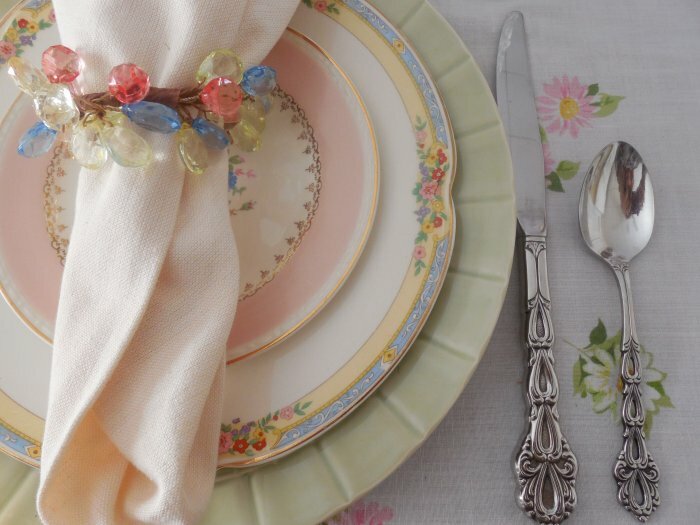 A quick visit to Pinterest to search for Valentine’s Day tablescape ideas shows that by far (and not unexpectedly) the most popular color scheme for such a table setting is red and white. 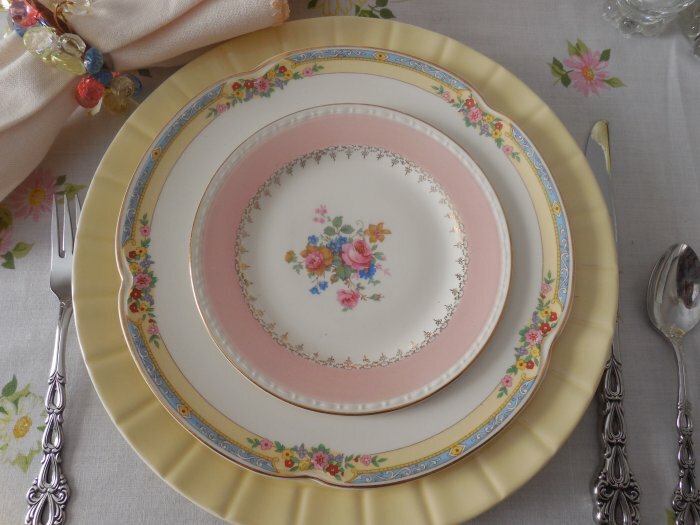 There is a bit of wiggle room for a pink and white variation, but that’s pretty much it. 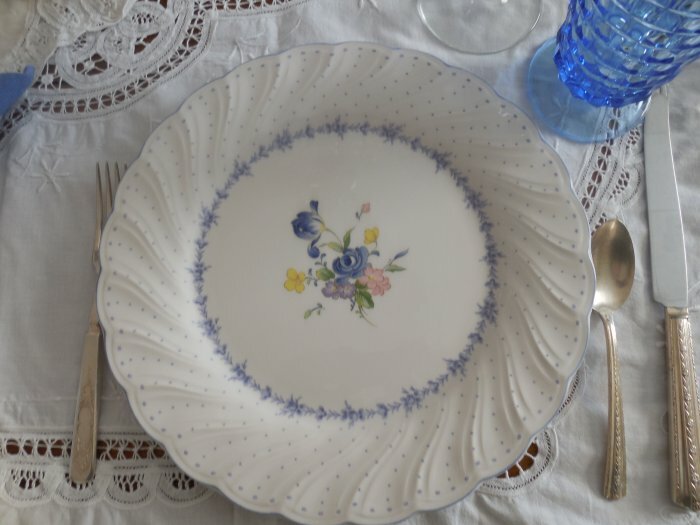 I think, though, that we should also make room for blue and white, if only because of a dinnerware set called Blue Peony made by Nikko. 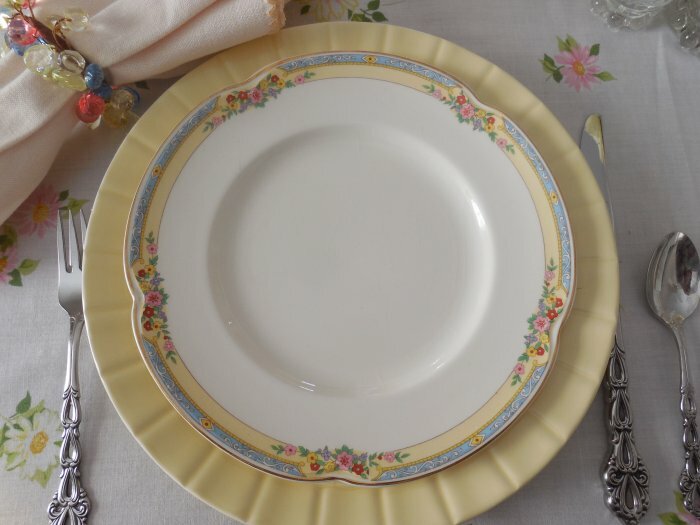 Seriously, when I found these dinner plates for 99 cents each at Goodwill, the word that came to mind was “sweetheart.” A table for sweethearts. 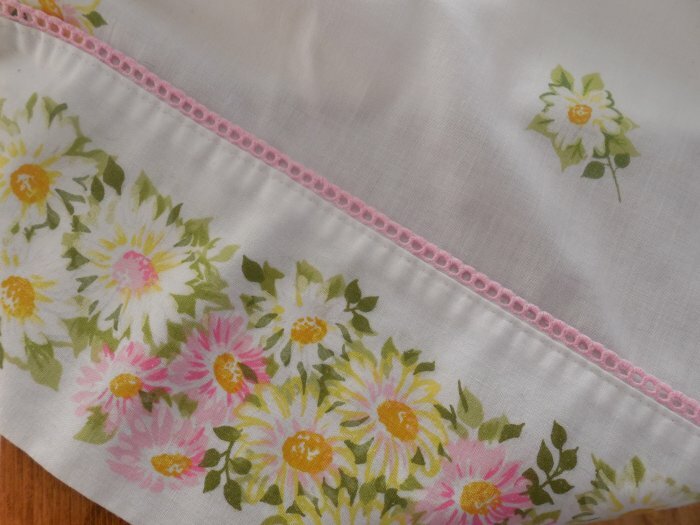 I think it was the ruffled edge and those tiny polka dots. 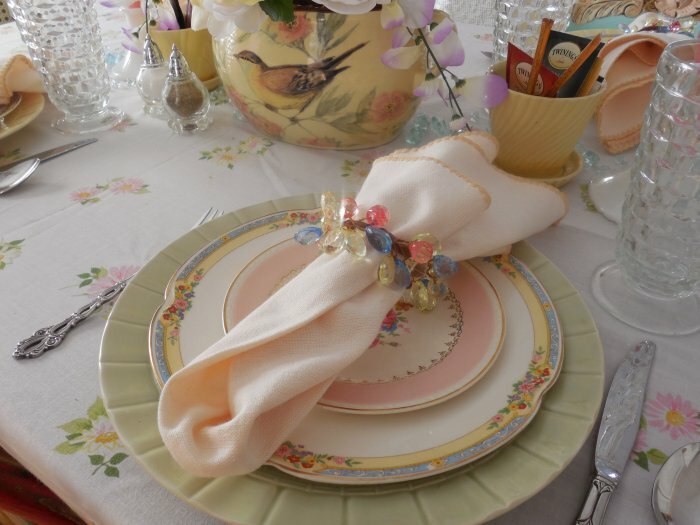 If you enjoy tablescapes please check out and join my Facebook group, Thrifty Tablescapers. 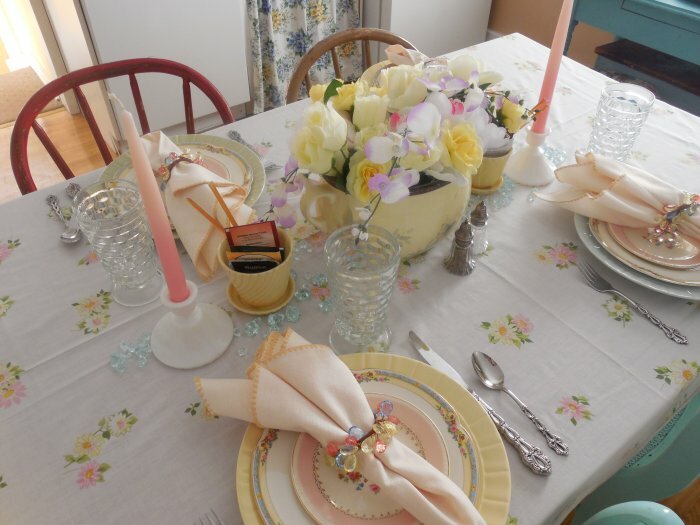 We are a fun group that loves setting, viewing, and sharing pretty tables on a budget! 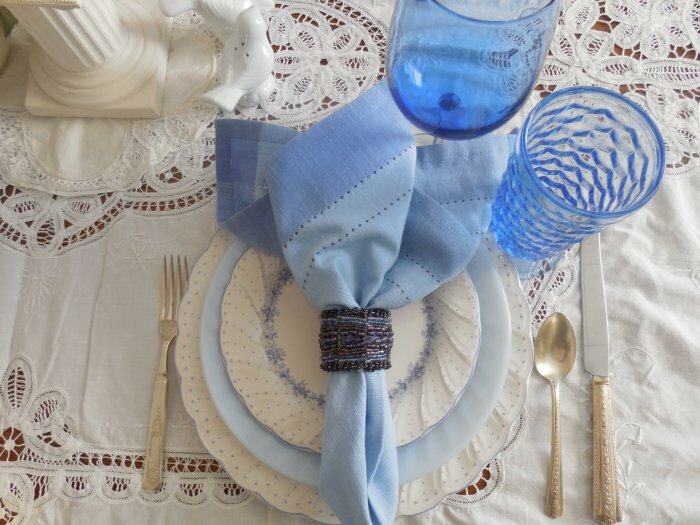 I’m using my white cutwork tablecloth because it also has a very “sweet” vibe. 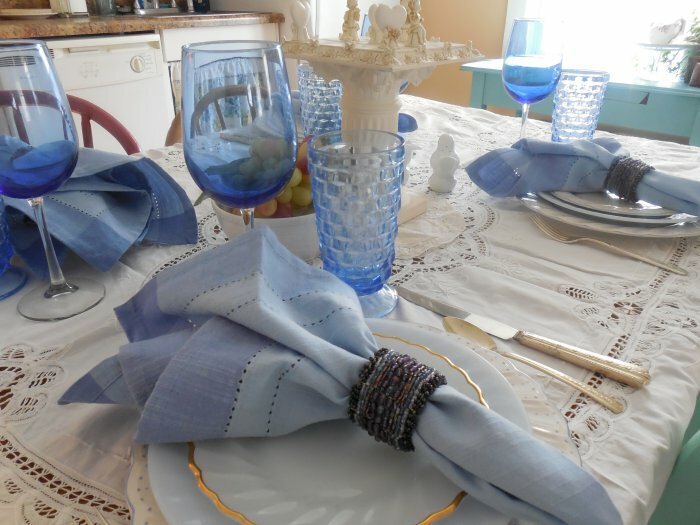 The blue hem-stitch napkins are from Pier 1, and the blue beaded napkin rings are a thrift-store find. 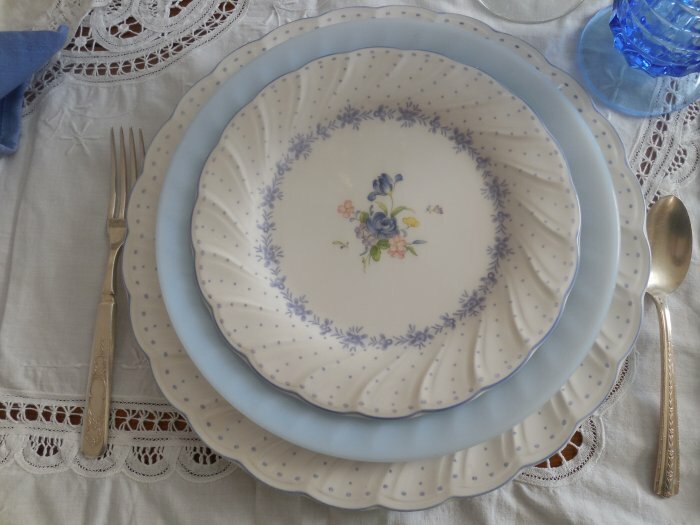 I love how the rings pick up the slight variations of blue from the flower border in the dessert plates. 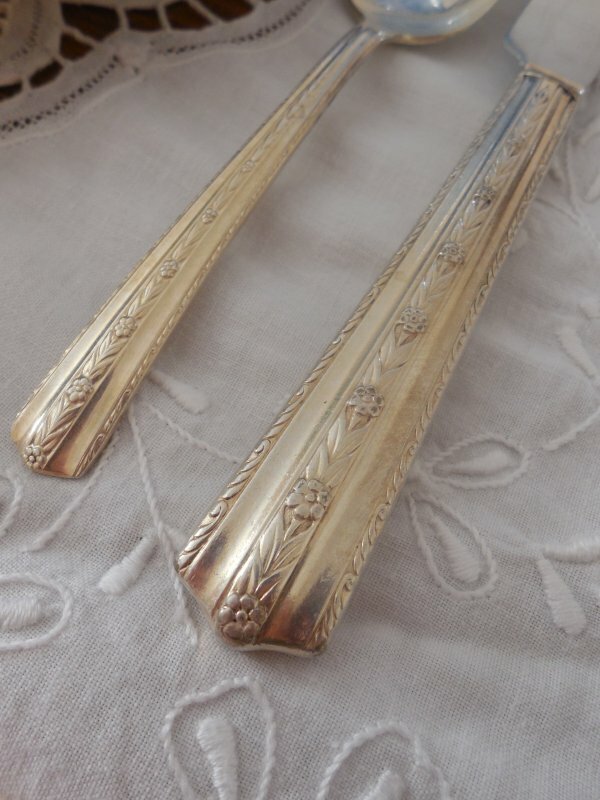 Flatware is real silver from last summer’s Antique Jamboree here in Valley Junction (50 cents each… I mean, how could I not at that price?). 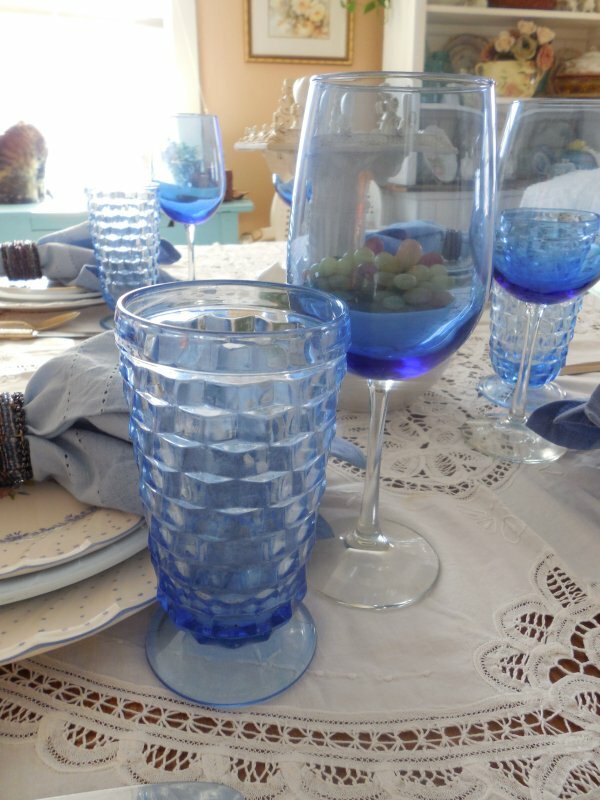 Blue tumblers are my favorite Whitehall by Indiana Glass, and the large stemware is from Dollar Tree. 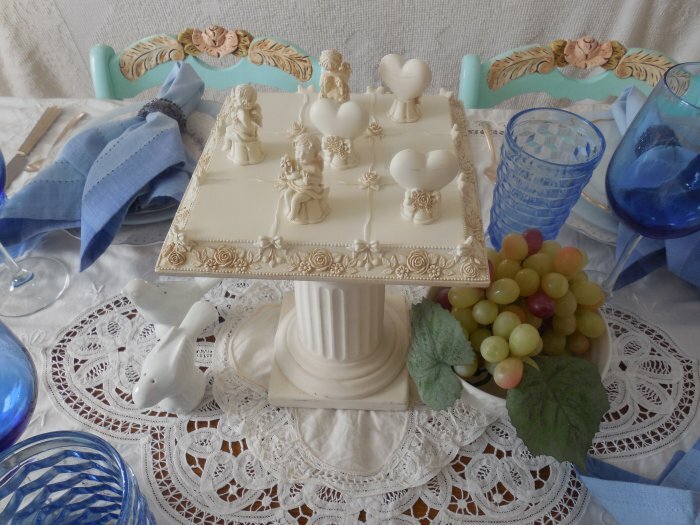 What nudges this table fully into the “sweetheart” realm is the centerpiece, and the focal point of the centerpiece is one of my all-time favorite Goodwill finds – a cupid-themed tic tac toe board. 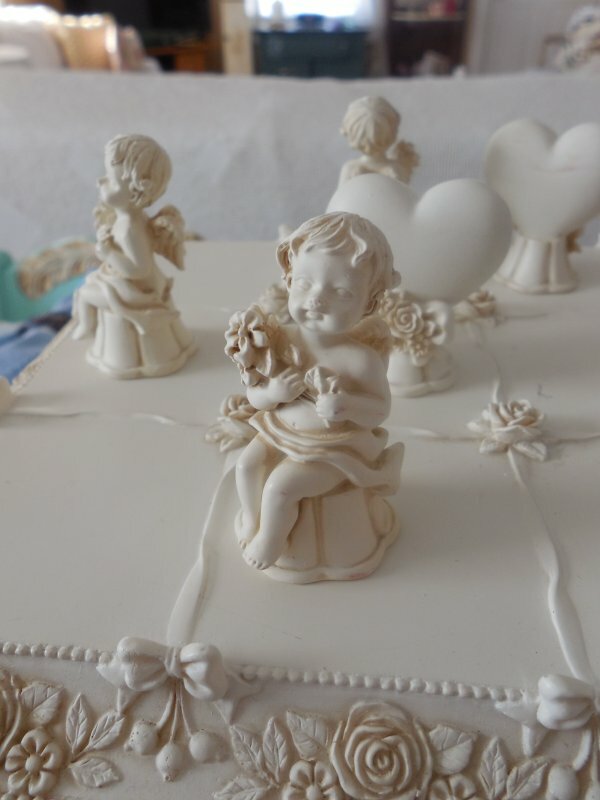 I found the Cupid and heart pieces of this set many years ago. They were in a large plastic bag, and marked $1.99. 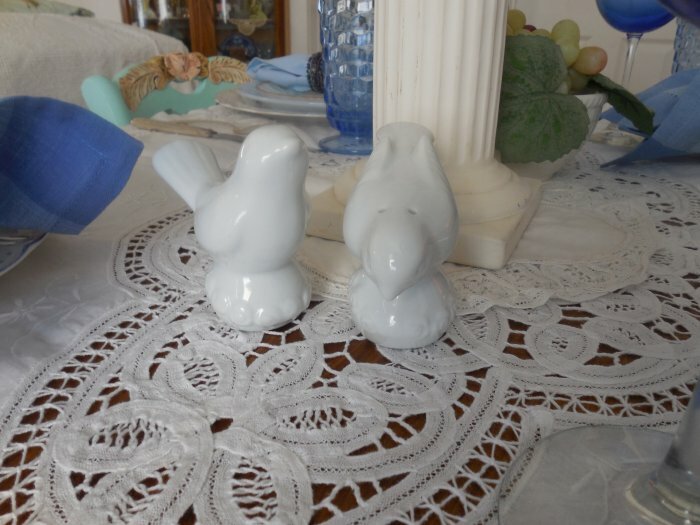 I bought them because the were absolutely lovely – I didn’t know for sure at the time, but my best guess was that they were game pieces. It was several weeks later, at the same Goodwill, when I found the board itself, also $1.99, which confirmed my guess. 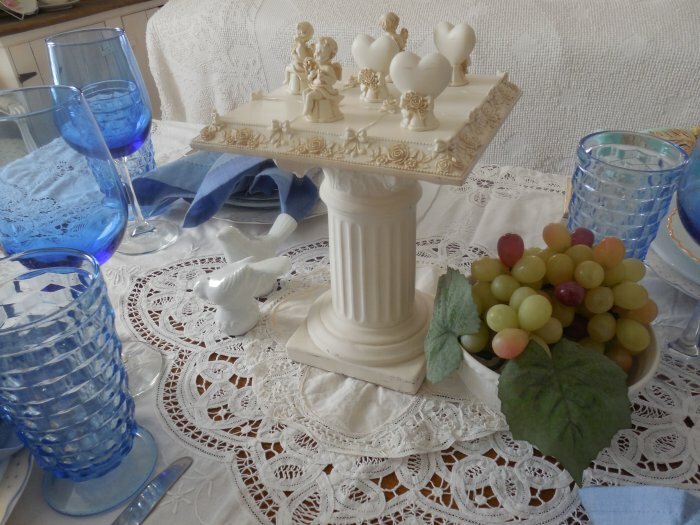 I perched the game board on top of a small ceramic column pedestal (also a thrift store find) to give it some height – hopefully that wouldn’t keep guests from playing the game, since it’s quite sturdy! 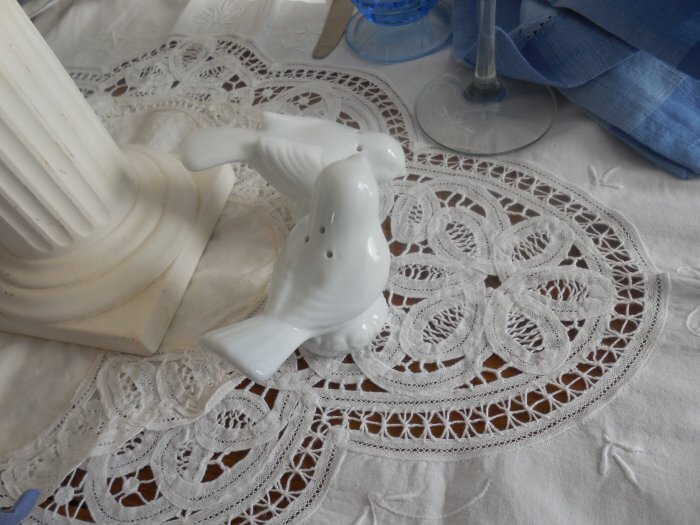 I used my pretty white ceramic bird salt and pepper shakers, and placed a white basket-weave pattern bowl on the table as well, filled with grapes. 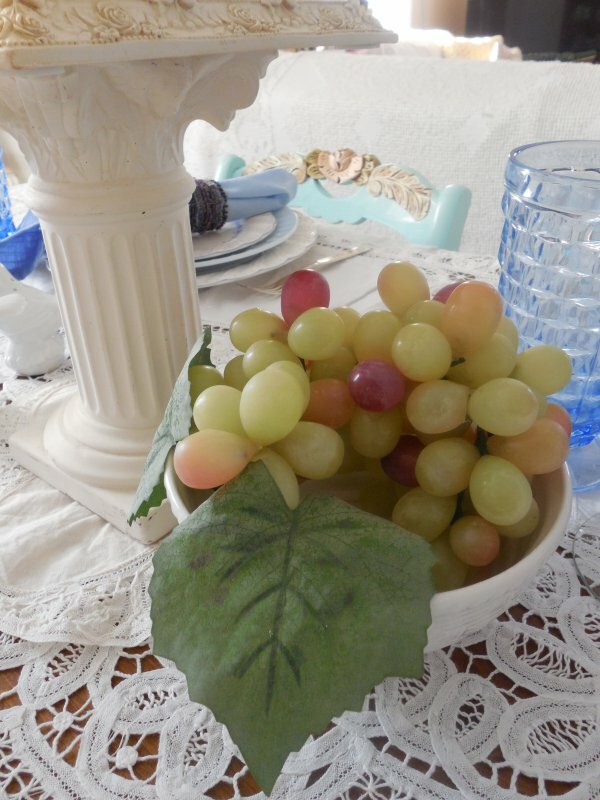 Well, these are technically faux grapes, but certainly they’d be real if there were actual guests at the table! 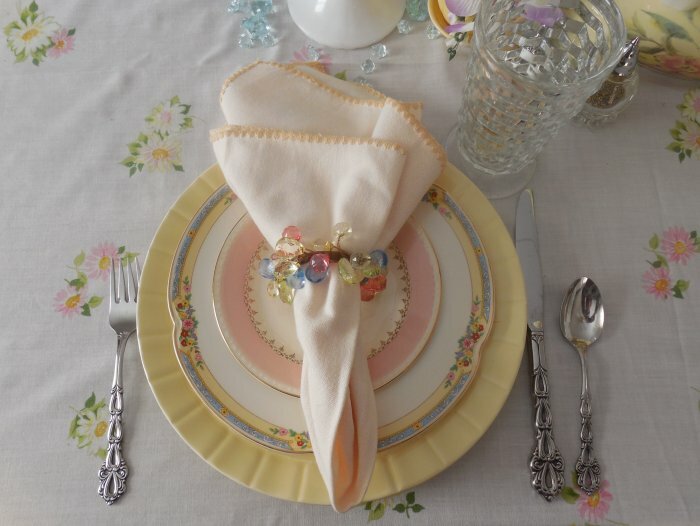 Speaking of actual guests, I envision this meal including a lovely fresh strawberry and spinach salad with raspberry vinaigrette dressing, chicken cordon bleu with warmed carmelized vegetables, and strawberry cheesecake for dessert. I have no idea if these dishes “go together,” flavor-wise, but it all sounds delicious! 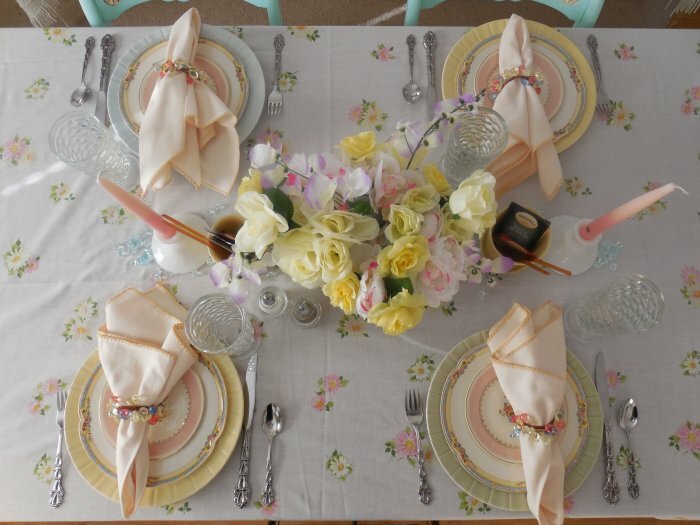 Here is a birds-eye view of the table – simple and lovely! 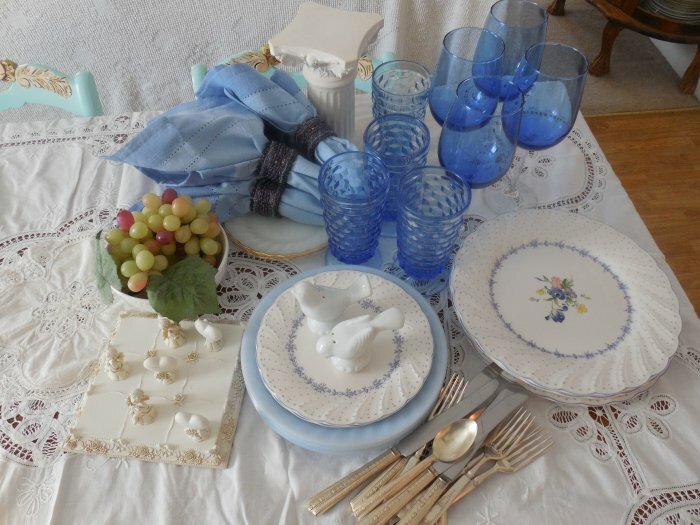 And here are all the elements of this tablescape disassembled and waiting to go back into the cupboards. 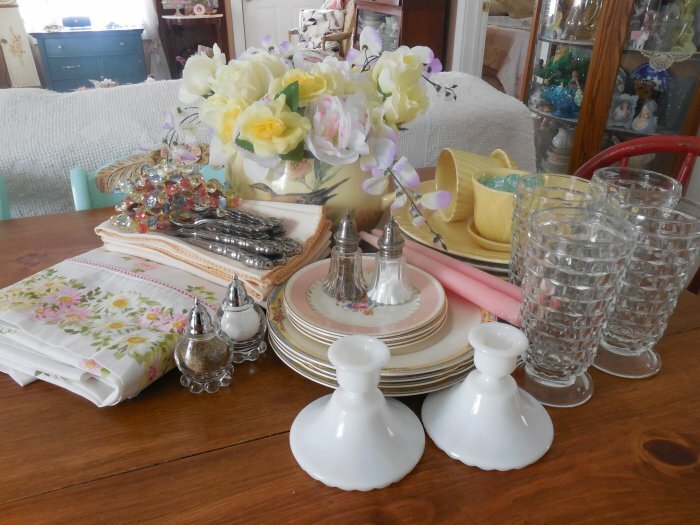 I love the “put-away” shot because it shows how well everything works together – coordinated but not matching. Oh – and guess what! 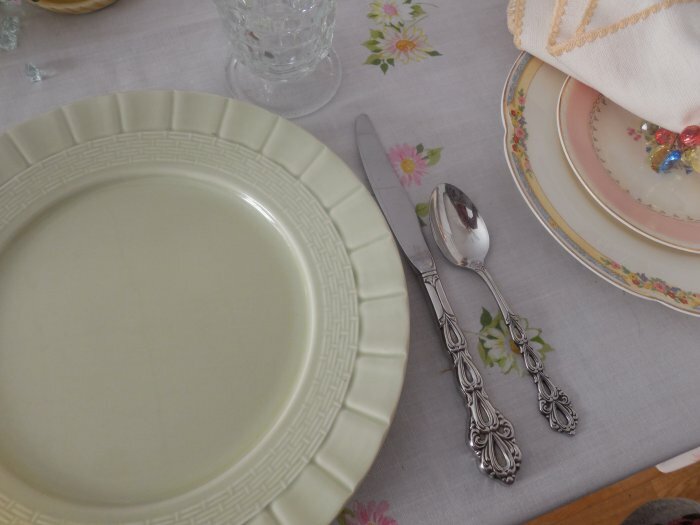 You probably already noticed this, but I learned recently that I’m placing my flatware incorrectly – apparently the spoon goes to the right of the knife! 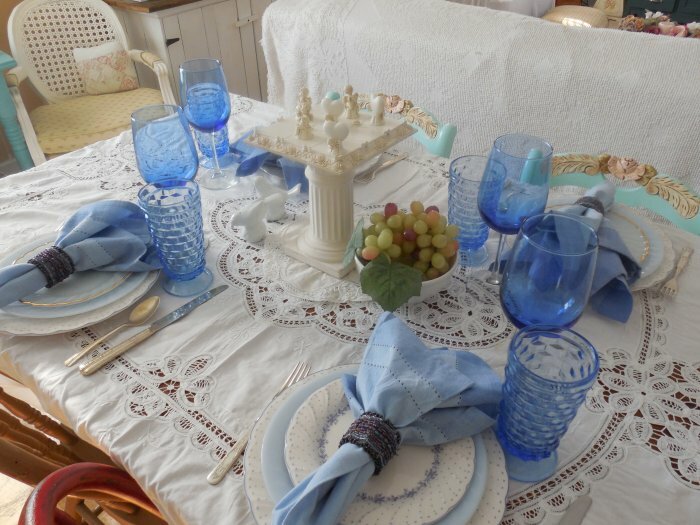 I admit I rarely look up the “rules” when I am setting tables – I tend to go by memory, and obviously on this point my memory is faulty! 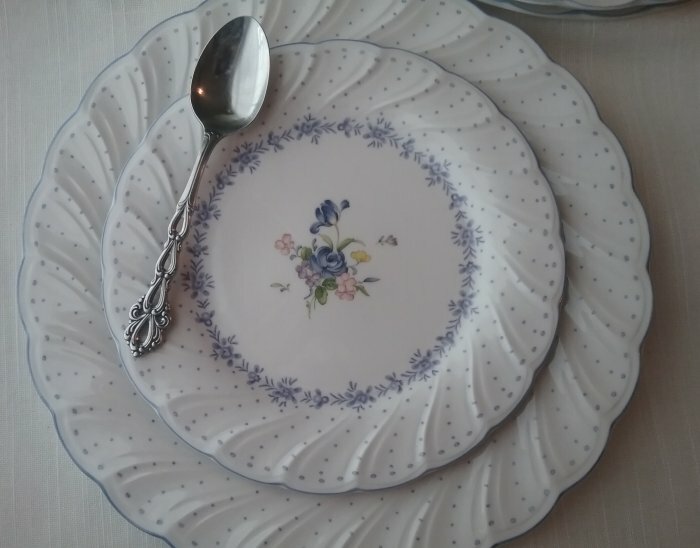 In fact, I used to set them with the spoon on the left side of the plate, and the fork and knife together on the right. I distinctly remember looking that up one day and – horrors! – found that I was doing it wrong. Obviously I did not retain the part about putting the spoon on the outside right! 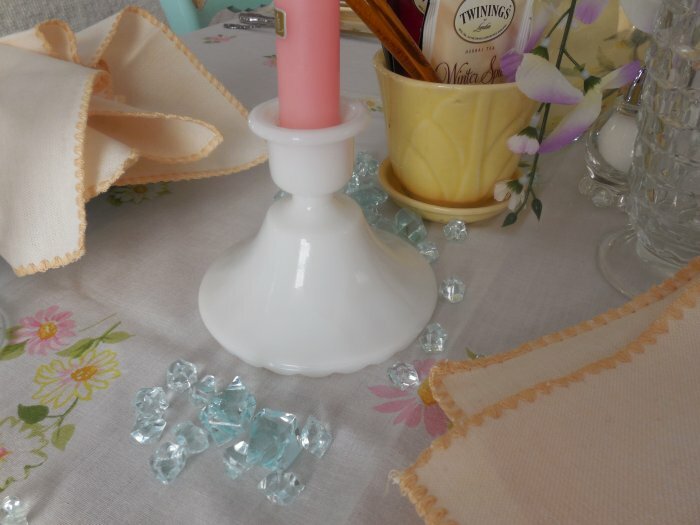 Certainly I will try to remember the right way in future tables, but quite honestly I am not going to lose any sleep over it… I will just have to live with being a rule-breaking tablescaper! Who are your “sweethearts”? 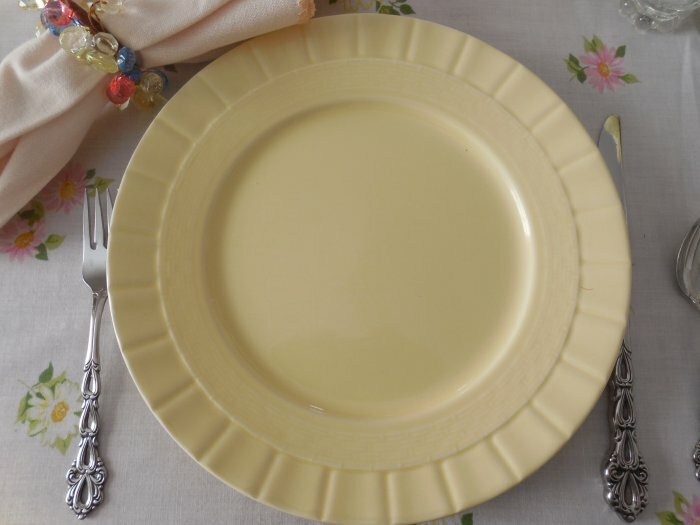 What would you serve for a Valentine’s Day meal? Please share in the comments! 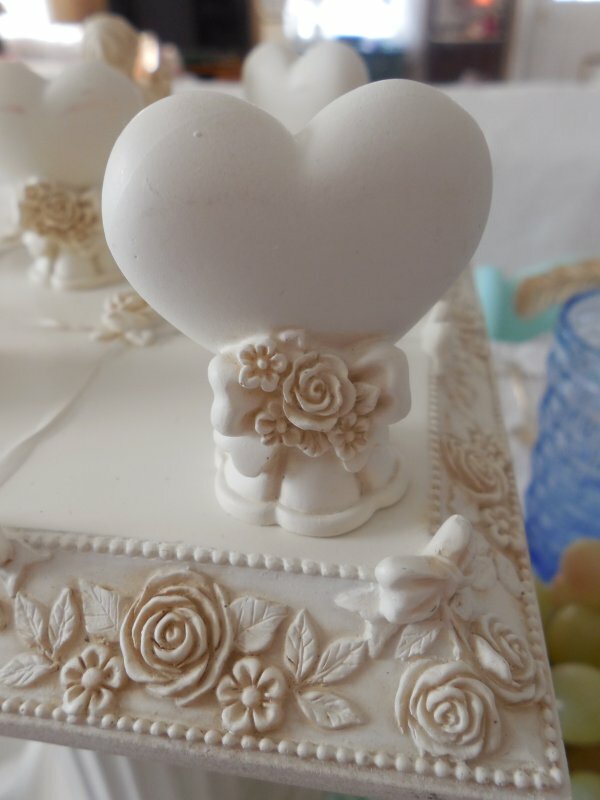 Here’s an image to Pin in case you would like to save my sweetheart table for future inspiration. 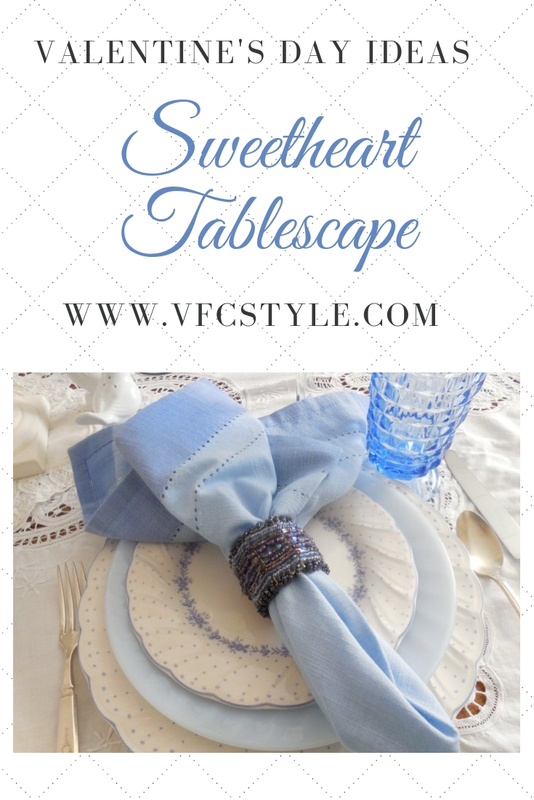 I am sharing my sweethearts table for Tablescape Thursday over at Between Naps on the Porch! 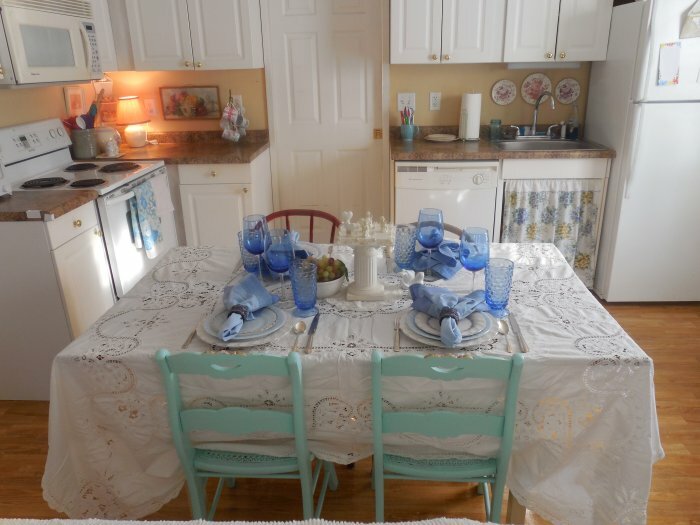 Boho-chic window treatment: something different in the cottage! 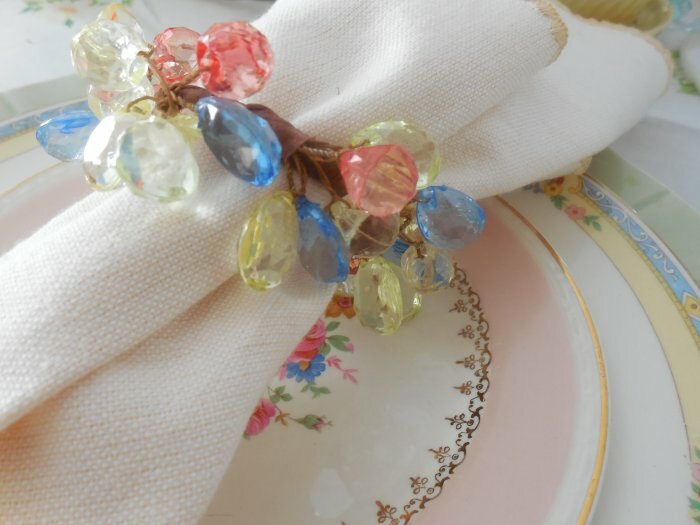 Recently I was looking at Pinterest and created a new board to pin examples of “Bohemian” or “boho-chic” decor. I love the way this style can be used to create an enclosed cocoon atmosphere in the bedroom! 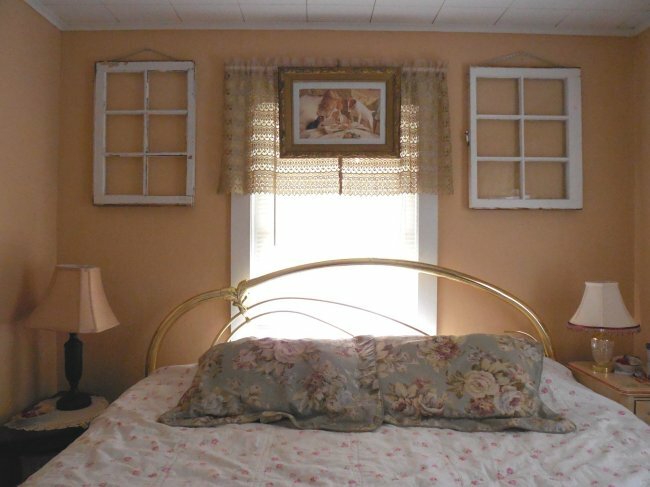 Although that is something I probably can’t do in my space because the ceiling fan would blow things around too much, my bedroom had already been taking on a bit of a boho-chic feel and I did feel like perhaps I could get away with some kind of unique window treatment. Here’s a recent photo I took of the “bed wall.” (A few things have changed since this was taken, but the wall itself is the same.) 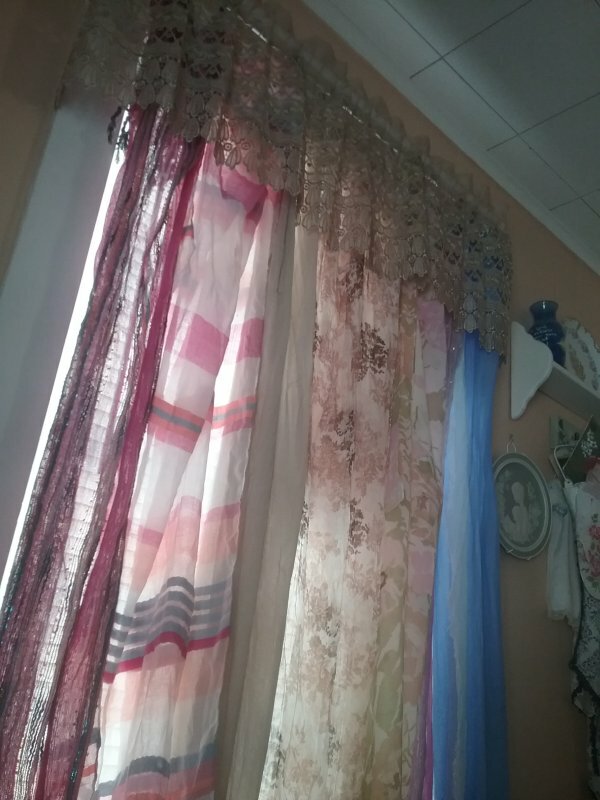 Note the pair of cafe curtains used as a valance – they are a shimmery champagne color, and I was using the matching valance from this set as a “scarf” on the top of my bedroom bookcase. 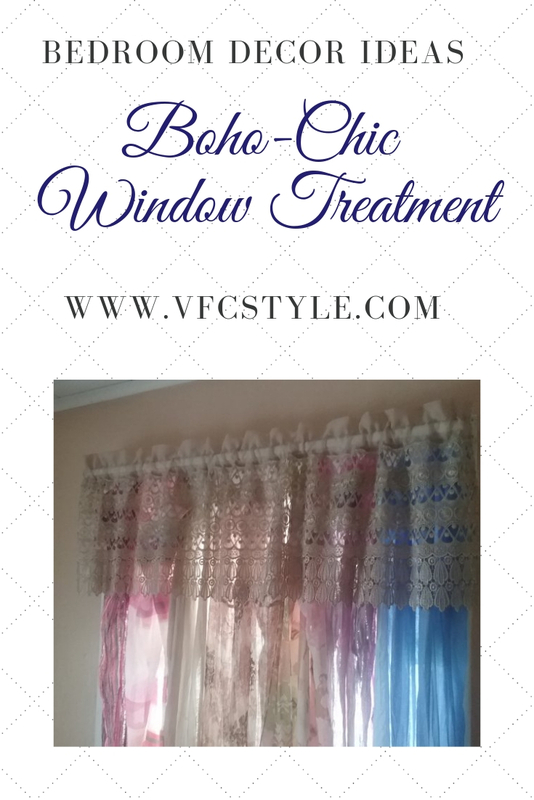 The window I decided to experiment with had only white window blinds and a floral fabric valance for covering. 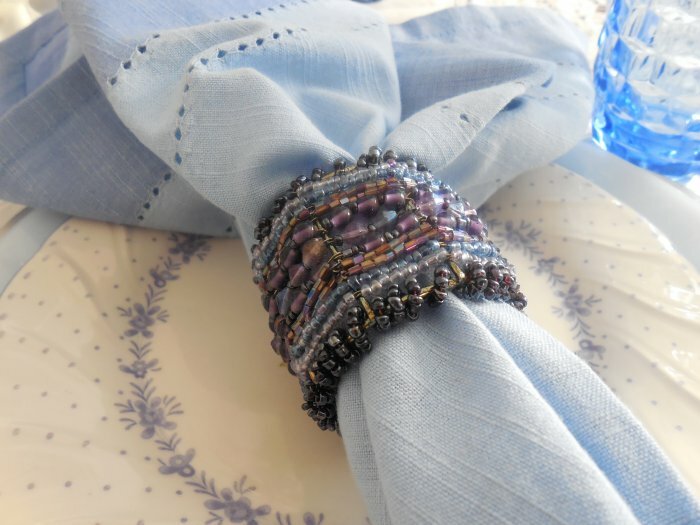 My thought was that maybe I could do something using thin scarves or wraps – you know, the kind you can tie around your neck in a hundred different ways. 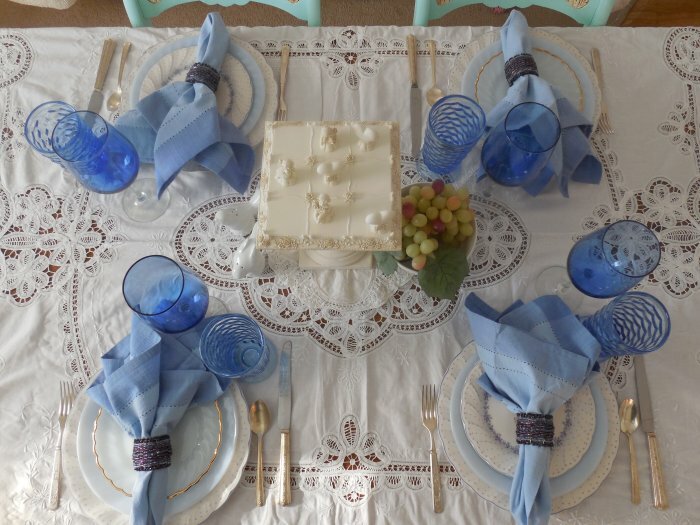 Although I do love the jewel tones that are often used in the boho style, I didn’t want my window covering to be too dark and I needed the colors to work well with what I already had in the room. I also didn’t have a lot of money to spend on the project. I decided to try the Stuff, Etc. consignment store near my home, and I was not disappointed! 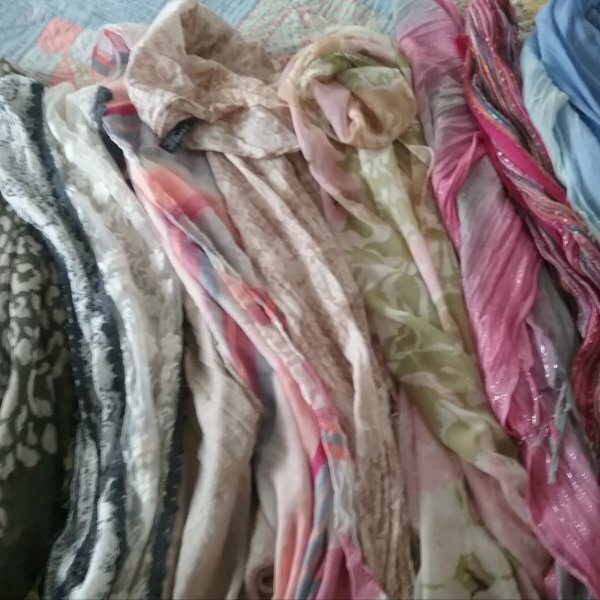 I happened to hit the store during a big season-ending clearance sale, and I sorted through dozens of wraps and picked out about 8 of them for $1.39 each. 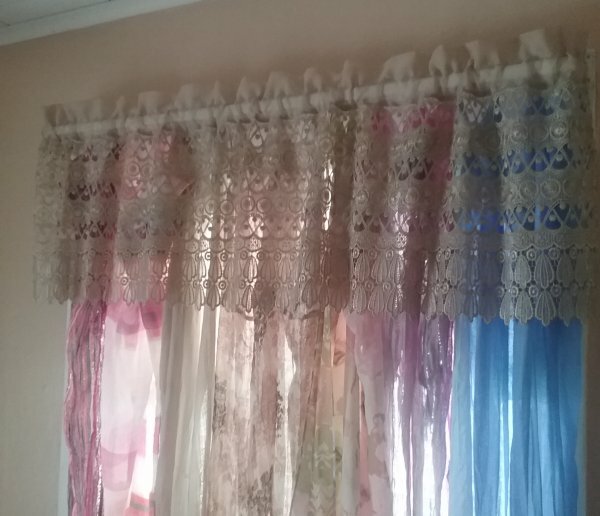 I decided I would simply drape them from the curtain rod, so I hand-sewed small ribbon loops on them and slipped those over the rod. I put them in an order that seemed to make best use of the colors and patterns, even using a couple that were a little brighter in tone than the rest. 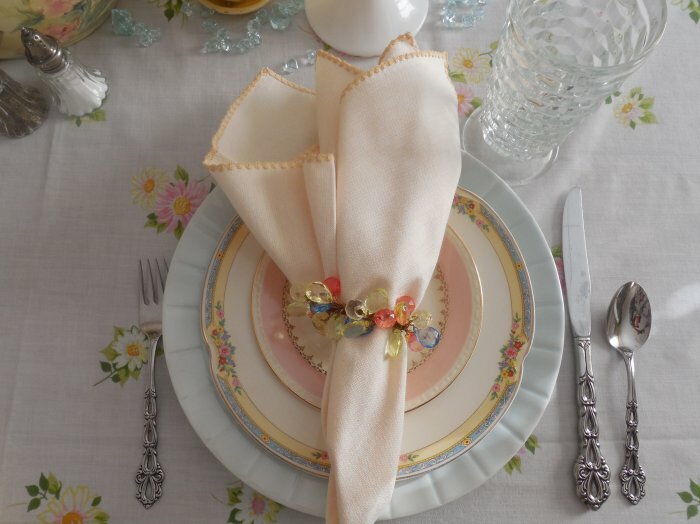 I then used the champagne-colored valance to top it off. 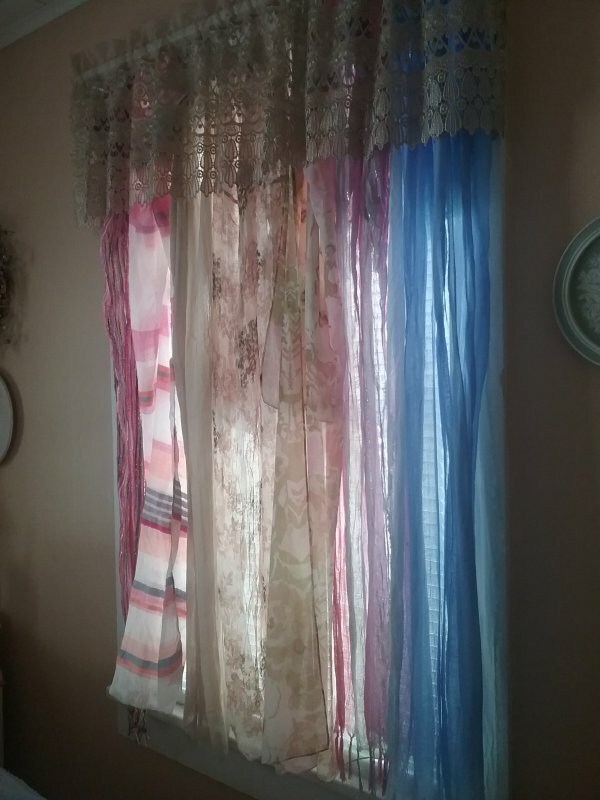 I love the billowy rainbow effect and the light, sheer quality of the fabrics. 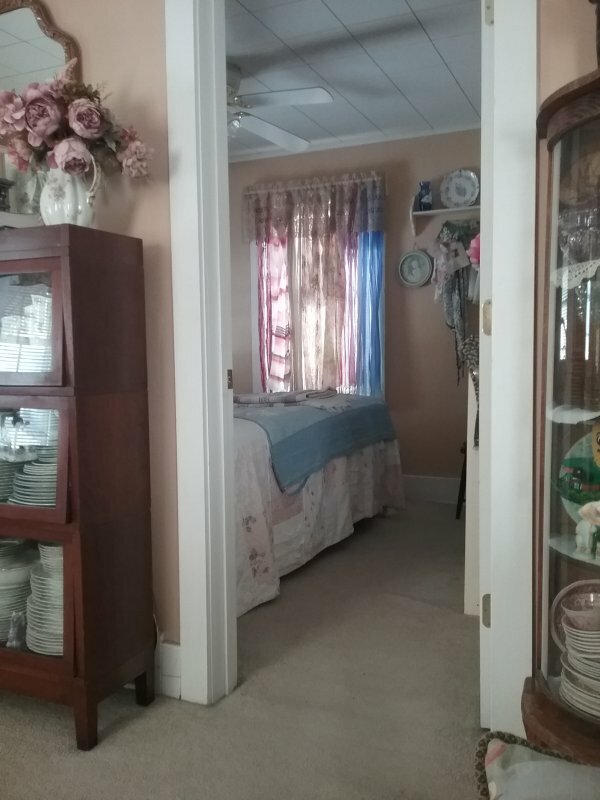 Here’s what it looks like when you walk past the bedroom door – I love how well it works with the colors in the room, and I feel like it kind of draws you in to see the rest of the room – which is definitely taking on more of that boho-chic vibe as the transformation continues! 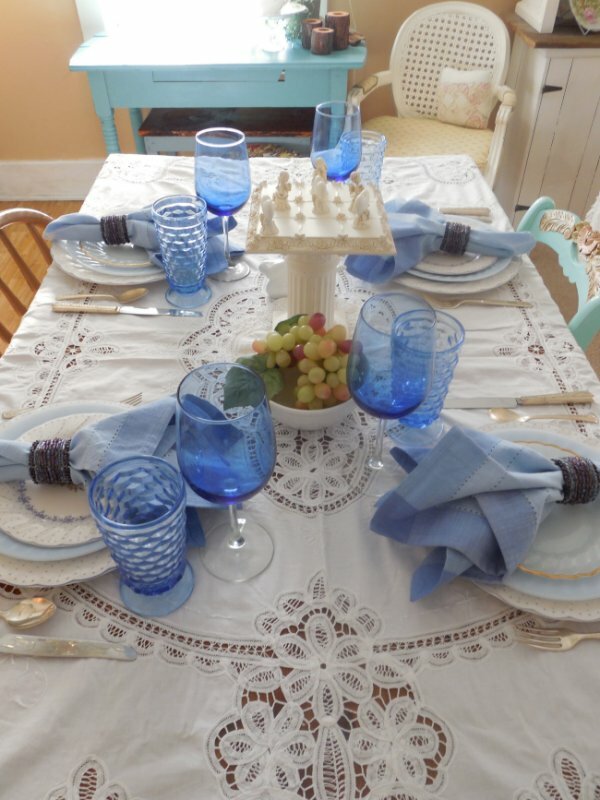 Here’s an image to pin in case you would like to save my boho-chic window treatment for future inspiration! 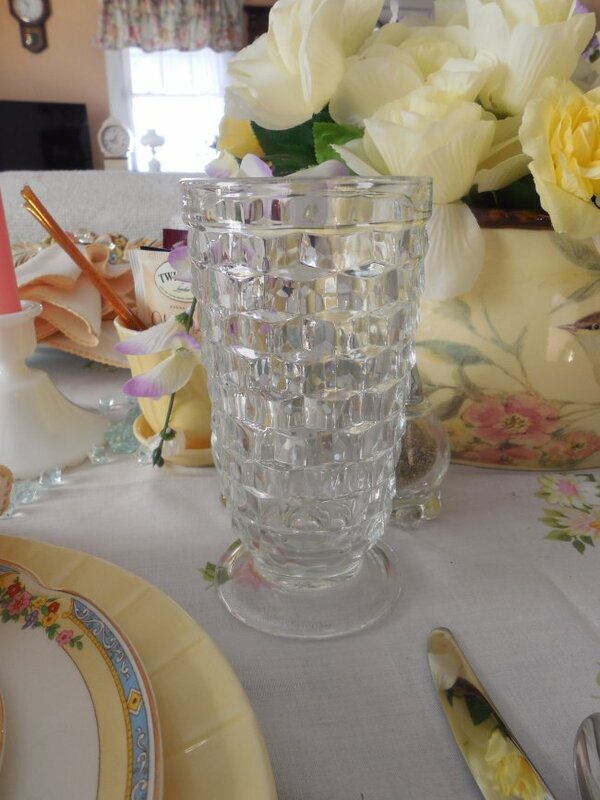 If you know your cheap table wines, you will recognize this pretty glass jug. I won’t name the brand, because I tried the wine and it was awful. To be fair, I am not a wine drinker, so I know absolutely nothing about it. But I’m pretty sure that on the ladder of wine, this is the stuff on the second rung, right above the Boone’s Farm and the MD 20/20. Anyway, the grocery store where I work part-time in the wine and spirits department recently had this brand on sale for just $3. 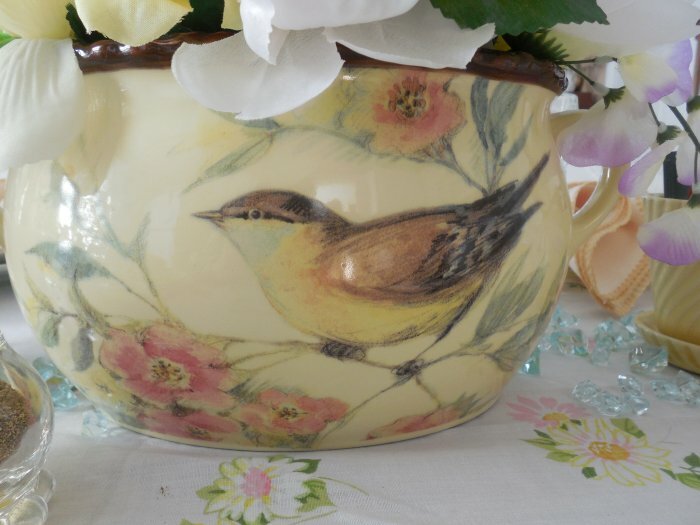 (Mercifully marked “discontinued.”) I walked past it many times over the course of my evening shift, and I knew that I really wanted to have that amazing glass jug. And eventually it occurred to me that if I saw the glass jug already empty in the Goodwill for $2.99, I would buy it. So why was I even giving this a second thought? 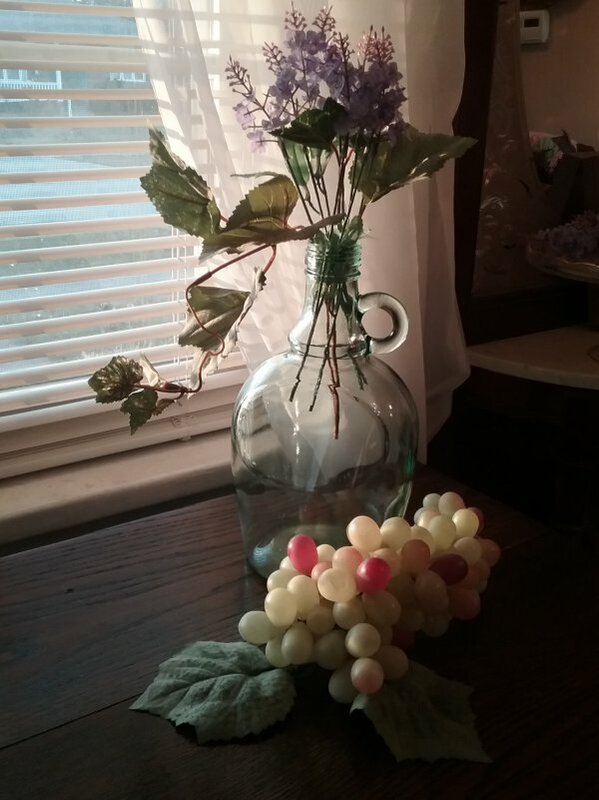 So for $3, I purchased the jug full of wine, tasted the wine (“bat urine,” as Dave Barry once proclaimed, since he is not a wine drinker either), dumped out the wine, cleaned the jug, and I’m now using it as a container for silk flowers and, ironically, faux grape vine. I mean I’m sorry for the grapes who gave their lives for this particular purpose, but in all honesty this company could probably make just as much money selling beautiful empty glass jugs and save the time, effort and expense of making that terrible swill. 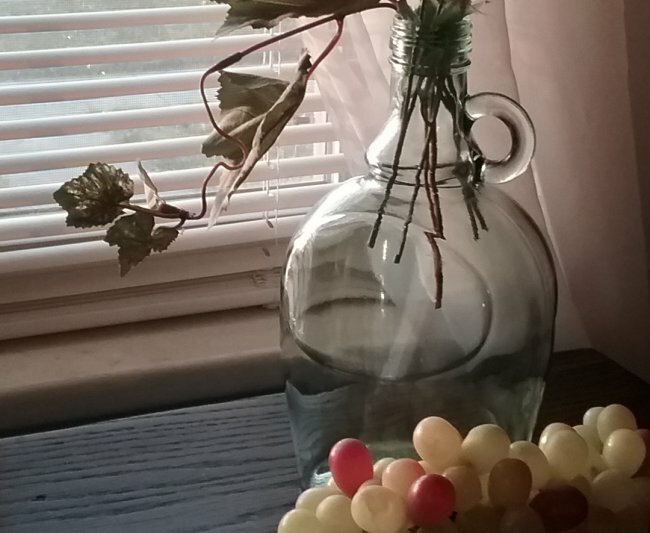 I paired my glass wine jug with a bunch of faux grapes just for spite. 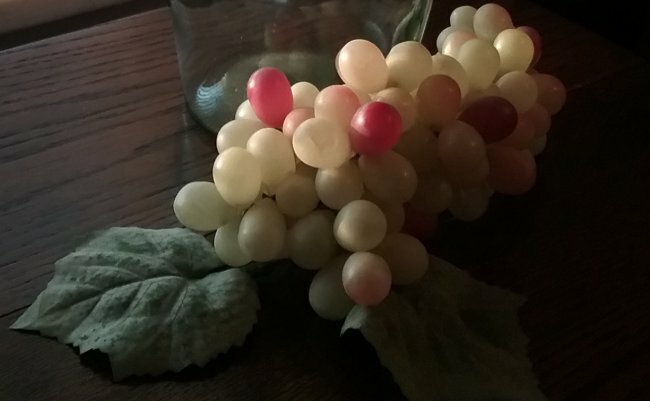 I’m sorry, grapes, I know it was beyond your control.